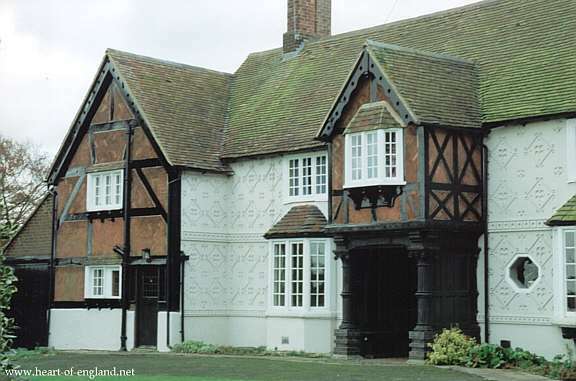 Church Lawford and Kings Newnham are two villages occupying the Avon Valley, between Coventry and Rugby. 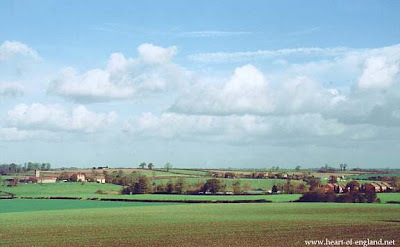 This picture shows part of the small village of Kings Newnham, viewed from the A428 Coventry to Rugby road. This is a slightly wider view of the scene above. In the centre of the picture can be seen the River Avon (white). The houses just beyond are also part of Kings Newnham. 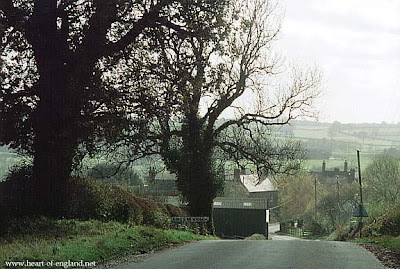 The houses at the right of the picture are the village of Church Lawford. The picture below is a wide angle panorama, through almost 180 degrees, showing the entire view of the Avon Valley at this point. 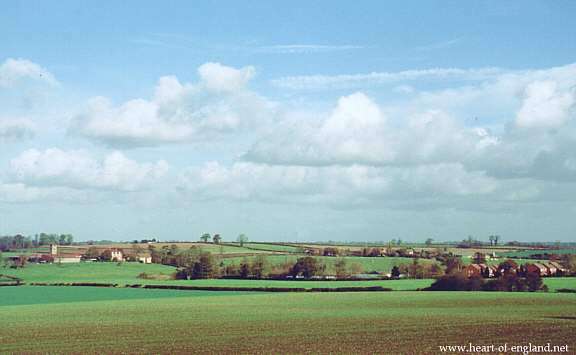 At the far left lies Coventry, Kings Newnham is two-thirds the way along the picture, and Church Lawford is visible at the far right. 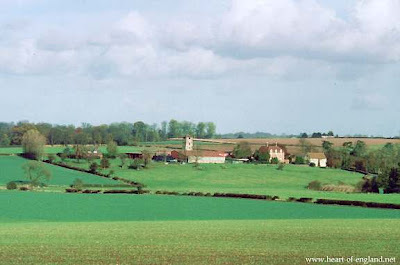 Rugby lies beyond Church Lawford, to the right. Various woods are visible in the background, and the River Avon meanders back and forth across the picture. You can click on the picture to enlarge the image. This is a view looking towards Church Lawford from the Rubgy side. The River Avon is visible in the foreground. The river meanders wildly in this area. It flows right-to-left in the foreground, but just behind, where there are willow trees visible, it flows back left-to-right. The church tower visible in the distance is St Peter's Church, Church Lawford. 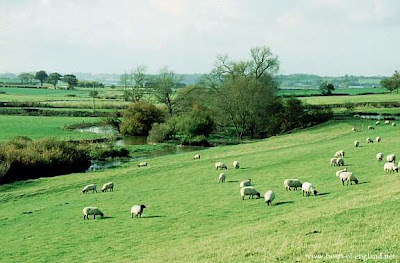 Sheep grazing on the banks of the meandering Avon. 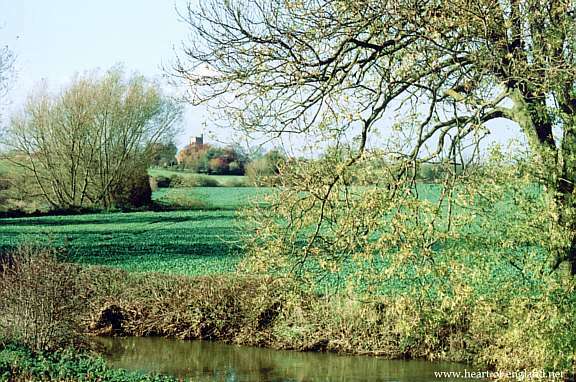 This view is taken mid-way between Church Lawford and Kings Newnham, looking down the Avon Valley in the direction of Coventry. The tall buildings of Coventry are just visible beyond the group of 3 trees at the far left of the picture. A ford across the River Avon. 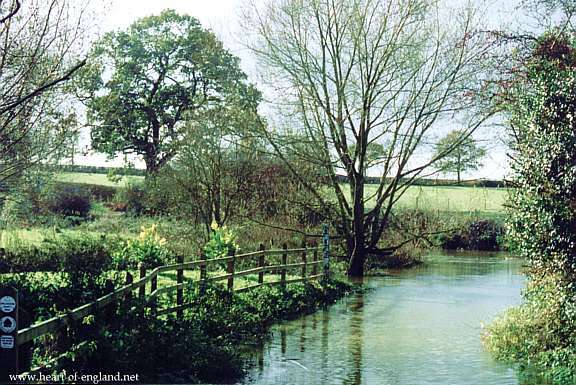 The place name Law-ford means a ford over the river. I don't know if this is the original ford. The Avon flows left to right, behind the fence in the foreground. The water in the foreground is the roadway, which crosses the Avon here, then rises up the far bank. A view looking down into the village of Kings Newnham from a hill just behind the village. 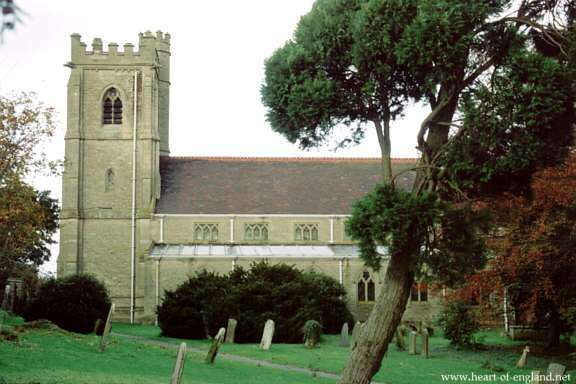 St Peter's Church, Church Lawford. The Elizabethan Manor House, Church Lawford.